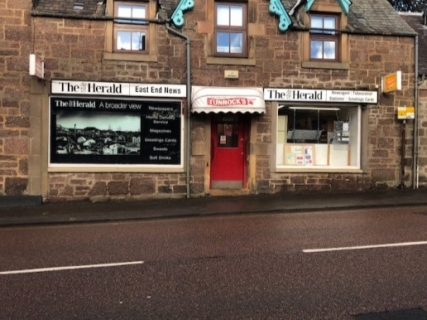 Central Business Sales is delighted to offer to the market a rare opportunity to purchase a freehold commercial property with long established local newsagents business in a great lifestyle location. The business has been established for over 20 years, with the present owner running the business since 1999. The shop offers an excellent business opportunity, with significant potential and the freehold property is a great investment. The business has been run as a local newsagents and offers a range of magazines, tobacco products, stationery, confectionery, toys and soft drinks. There is significant scope to expand the business by adding cold filled rolls and sandwiches, teas, coffees, soups etc. Alternatively planning permission could be applied for to turn the property into residential accommodation. The large premises are approximately 65m² in size. The double front entrance leads into an open plan serving and display area. There is a kitchen area and stock room area to the rear. The premises could benefit from being modernised. The business and commercial property are being placed on the market for offers around £65,000. This includes the property, goodwill, equipment, fixtures and fittings. The business benefits from 100% small business rates relief. It is run by the owner and is open 06:00-13:00 seven days a week.